The phonebook has seen almost no changes and still has no smart dialing (you have the system wide Spotlight search for that). It is the same simple and easy to use app, down to the usual alphabet search. A new thing is the Related people field in the phonebook. You can identify your contacts with labels such as mother, father, parent, brother, sister, child, friend, spouse, partner, assistant, manager, etc. Do have in mind though that all the labels are available only for the native iPhone contacts. With a set of Google-synced contacts only three labels were supported: spouse, assistant and manager. There is a new Social Profile field too. You can use it to save Twitter, Facebook, Flickr, LinkdIn and MySpace account names. Another new thing about the telephony on iOS is that mail, voicemail, calendar and reminder sound alerts are customizable, finally. In case you don’t like the provided ringtones and you don’t know how to make one yourself, you can now choose Buy More Tones directly in the sound settings. You will be redirected to the iTunes Tone Store (the iTunes app) and you can buy whatever tones you like there. FaceTime also gets a new feature. If your carrier does not support FaceTime activation by phone number, you can use your email as ID. It's done automatically if the phone number activation fails. Just make sure you are connected to a Wi-Fi network and turn the FaceTime on in Settings. You can also choose your FaceTime ID - even if you use email activation, you could still use your mobile phone number for identification. First things first: dropped calls are so 2010. A dual antenna setup gets rid of the death grip issue. The phone can intelligently switch between the two antennas as needed (even in the middle of a call), so if one antenna is blocked, the other takes over. Not only is there no wrong way to hold the phone, the overall reception seems a lot better now. We repeated our tests from last year. We made a few calls from a residential area of really poor coverage and while the iPhone 4 barely held to signal, much like any other phone we’ve tested, the iPhone 4S (working on the same network) showed at least 2 to 3 bars. There were. No dropped calls, no voice drops. You should note that according to Apple the iPhone 4S has double the SAR values of the previous iPhones, but within safety levels. We guess that's the price to pay for the excellent reception. 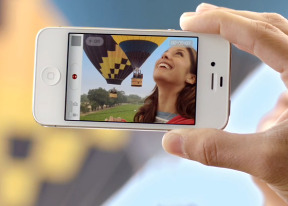 You've probably heard the iPhone 4S is a world phone working on both CDMA and GSM networks. This works only one way though. CDMA is only available on handsets activated for use on a CDMA network. If you bought your iPhone with a GSM SIM card it won't support CDMA. The loudspeaker performs better than on the iPhone 4, although not a massive improvement. It scored Average in our traditional loudspeaker test, while all the iPhone 4 had a Below Average result. The results are similar to what we saw on the iPad 2, we guess both devices use the same speakers. Anyway, although the iPhone 4 and 4S score equal in the pink noise and the music/voice tests, the 4S sounds richer and deeper. In the ringtone test there is an increase of up to 8db. FaceTime video calling over Wi-Fi is enabled on the iPhone 4S of course. The iPhone 4, iPad 2 and the new generation of Macs, as well as the last-gen iPod Touch are the compatible devices. The messaging app stores all your messages within threads and offers options for mass delete and forwarding. There is a search field, MMS support (if you choose to attach a multimedia file) and character counter. The SMS delivery reports are still missing though. iOS 5 keeps the simple and intuitive interface but brings a functionality boost with the iMessage service. The iMessage service lets you exchange instant messages between iOS 5-running iGadgets via Wi-Fi or 3G. You can send plain text as well as multimedia (pictures, sounds, videos) messages. To activate the iMessage you just need to go to Settings->Messages and turn it on. But how does it work? You tap on the new message button and you'll see the standard message composer with a green SEND key. When you choose a recipient you'll notice a small loading icon right next to the name. If the person you are texting has the iMessage service, your SEND key will turn blue and the top bar will say New iMessage instead of New Message. Yes, it’s all automatic. The rest is pretty simple - you type, you add content (optional) and hit send. The iMessage conversations are color-coded to differ from the standard SMS/MMS - their bubbles are blue instead of green. The iMessage service is essentially an IM - in an iMessage conversation you can see when the other person is typing and you get their messages instantly. You can also get Read Receipts – something they still don’t offer in the usual SMS app. Go figure! One more thing about iMessage - your ID is either your phone number or your email - just as in FaceTime. The Mail app gets a few tweaks of its own. It supports multiple email accounts (configurable in the Settings app) and offers Universal Inbox (showing all your mail at once). The Mail app also supports threads, email archiving and quick lookup of documents thanks to the integrated doc viewer. There is also an Open With… option, offerings depending on what you have installed (PDF reader, mobile office, iBooks, etc). Bold, Italic and Underline font styles are added to the text editing options as well as quote font size levels. Text selection works the usual way (tap&hold&select) and the available options will appear as soon you've made the selection: Cut/Copy/Replace/Bold Italic Underline/Quote Level. Quote Level will increase / decrease the quote symbols before the text you're quoting. You can also add or delete Mail folders now - just hit the Edit button when you explore the email account.